Get ready to hear three hours of nonstop rattling. 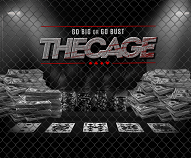 The Cage, Americas Cardroom's groundbreaking cash game, is set to get underway tomorrow, October 8th at 8:00pm ET. The time-based cash game with elements of an online poker tournament currently has over $100,000 worth of buy-ins and promises to be a Hold'em experience to remember. In The Cage, online poker players have 3 hours to take their 5,000 chip stack and make the right moves to stack it higher. The time-based cash game includes blinds and antes, which increase every hour. The Cage features three levels: Hour 1 with $10/$20 blinds and $2 antes; Hour 2 with $25/$50 blinds and $5 antes; and Hour 3, with $50/$100 blinds and $10 antes. At the end of level 3, each surviving player will swap their chip stack for real cash. For example, a player holding 42,000 in chips will receive exactly $42,000 in cash. The funds will be immediately credited to the player's account. If you don't have an account at Americas Cardroom, sign up for 27% Rakeback.